Before winter began the first bridge heated thanks to the warmth coming from earth interiors in cold seasons started to function inside the Sleswick-Holstein ground. The aim of the pilot project is to get rid of the ice over Elbe-Lubeck channel. When the temperature level falls down to 4 degrees Celsius, 11-degree water is being pumped up to the land surface from the depth of 80 meters. This water passes through heating spirals inside the asphalt. 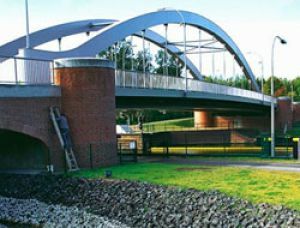 Bridge refurbishment expenses that were equal to the amount of 1 million euros were shouldered by the Federal Government. “Increased road traffic safety thanks to geothermic energy will lead to slippage elimination during ice slick periods”, – the federal transport minister Peter Ramsauer promises. Ramsauer expects acquiring experimental knowledge after introducing this project – this information might help in planning, building and placing many other objects in service. The heating system of the bridge was developed in Bundeswehr University in the town of Neubiberg not far from Munich.